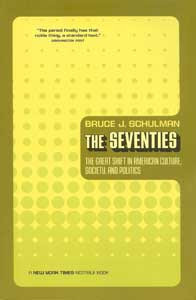 As research for my novel-meets-real-life book, I've been reading political writer Bruce Schulman's The Seventies: The Great Shift in American Culture, Society and Politics, which "attempts a rich, evocative portrait of the U.S." in that decade. He writes: "Most Americans regard the Seventies as an eminently forgettable decade -- an era of bad clothes, bad hair, and bad music impossible to take seriously. 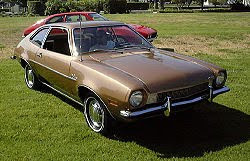 It was a Pinto of a decade, referring to Ford's mysteriously exploding compact car. It calls forth a rootless youth culture wavering between the political commitments of the 1960s and the career ambitions of the 1980s. "This impression could hardly be more wrong." Schulman counterintuitively finds the Seventies transformed morals and manners more than the 1920s and 1960s and politics more than the 1930s. And don't get him started on the revolutions in race relations, religion, family life, and pop culture. The booming economy and burgeoning population of the once outcast South and Southwest regions is one example he uses to highlight the changes in the 1970s. And it's true that the "Sunbelt" has sent the winning candidate to the White House in every election after 1964 (at least until Illinois' Obama won last year). Throughout the country, there was "a southernization of American life, a swing over to the simple, the clean, to the healthy" with many people embracing country music and southern rock, cowboy boots, pork rinds, Pentecoastal churches, and Confederate flags. With hair, "even those who had never been hippies, or never even liked hippies, displayed a willingness to let it all hang out." There were now religious pilgrimages, secular communes, senior citizen centers, ethnic organizations, neighborhood associations, and mall-walking societies, all filed under "a quest for personal fulfillment within a small community." Schulman interestingly claims "one, small historically insignificant event in the fall of 1968 signaled the end of the optimistic, liberal 1960s." This was when Jackie Kennedy married Aristotle Socrates Onassis, which "signaled the end of Camelot. The shining knight had died, and now the swarthy villain carried off his noble lady. The dream of the 1960s had died. The stormy, uncertain 1970s had begun." The last days of the Sixties "signaled the end of the post-World War II era, with its baby boom and economic boom, its anticommunist hysteria and expansive government, and the beginning of an age [in which] the experiences of the postwar generation would offer little guidance." In the 1970s, problems like stagflation and a revolt against taxes were introduced. I'm impressed with Schulman's insights into an often overlooked and important decade. I'll check back with you later on with more highlights from his book.